Recovering Working Mom: Radio Silence . . . So this week I violated the most sacred of social media and blogosphere rules . . . not having fresh content! (Can you hear the Al Roker echo?!) Well f*#@ those rules. Between PMS, a “Dear Mrs. Dugdale” note about boogers, packing for 5 people to go on vacation for 14 days, and working 60 hours this week, mommy is cranky, tired, and not feeling very funny! Remember when you were a kid and your mom would say “if you can’t say anything nice, don’t say anything at all” (for the full effect of how this should sound to you when you’re reading it, you need to go back and watch the Fresh Prince’s Parent’s Just Don’t Understand video – oh yes my friends, I sooooo went there) – and before I leave this topic - there was actually one year, 1997, when my mother decided it would be a great idea on the 23rd of December for our family to go to a public restaurant and air all of our grievances at dinner so that the following day we could be completely past all the hard feelings and have a fantastic Christmas. This great idea actually resulted in a phrase that will live in infamy in our family . . . two fights and a cry. We all can’t quite agree on who was crying and who was fighting at what point in the evening, but we do know that it involved my sister and I going at each other while my mother tried to appease both of us and my father, brother and at the time fiancé (now husband from heaven) all sat at the table just praying for a Christmas Miracle that it would end soon. Needless to say, after that we went back to the “don’t say anything at all” rule. Along those lines, here’s my rule for my blog . . . if you don’t have anything funny to say, don’t say anything at all. 1) Your mother will actually call you to find out if you’ve left on your vacation a week early because she hasn’t heard from you through the blog. 2) Your second grader’s teacher will send you a note informing you that she has had to remind your child repeatedly to stop picking her nose in class and to use a tissue, and could you please assist with this message at home. Apparently the teacher believes that nose picking is something that we condone and encourage in our home and we’ve sent our child to her classroom with this issue just to torture her. SHE’S SEVEN YEARS OLD FOR F*#& SAKE! If you wanted to work with people who didn’t pick their nose all day, maybe elementary school wasn’t the best choice. Whew, see, that sense of humor thing just slipped away again. That was pure PMS rage! 3) You will plan to take the Id’s (the baby) five year-old photo that you’ve put off for three months, only to have her completely injure herself the day before. 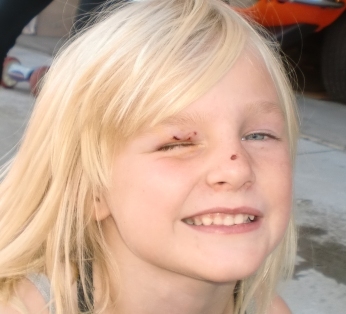 First she “got a rug burn” on her nose at gymnastics, and then her sister accidentally wacked her in the eyeball during a Wii baseball game (apparently the Ego thought her sister was a baseball). The Id’s gonna be 8 years old before we get those d@mn pictures taken. While we are on our cross country adventure, I promise to post periodically with our exploits, including my new game that is akin to Where’s Waldo – except in the Dugdalified version you have to find the Superego, Ego and Id while they are on their adventures. I’ll also sprinkle in those things I’m grateful for that you COULD find at your Thanksgiving table as well, although they wouldn’t be the same as at my table because more than likely mine will involve a cuss word or two! Can’t wait to spend Thanksgiving with you Grandma and Grandpa!!!!! They’re probably going to get on a different Carnival Cruise ship, aren’t they?! ha ha, you can make it! Only four days of nose picking, um school to go!